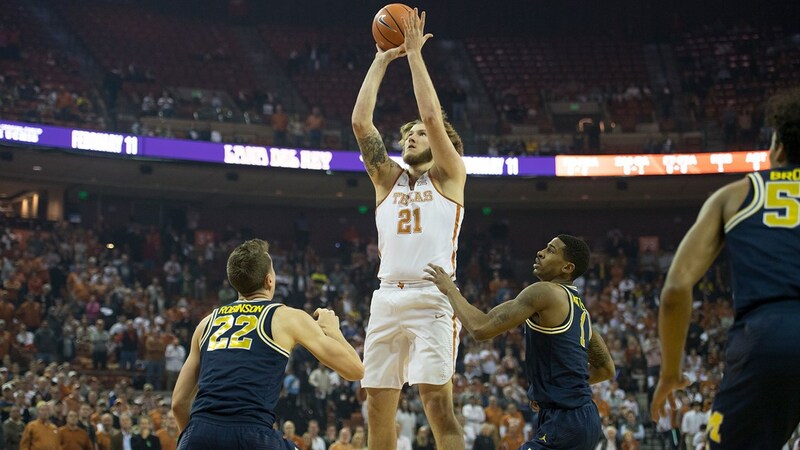 Forward Dylan Osetkowski scored a career-high 26 points to lead the Texas men's basketball team to a 79-73 win over South Dakota State in the first round of the NIT (photo courtesy of texassports.com). AUSTIN, Texas — Senior forward Dylan Osetkowski scored a career-high 26 points to lead the Texas men’s basketball team to a 79-73 win over South Dakota State Tuesday in the first round of the National Invitational Tournament (NIT) before a crowd of 1,739 at the Frank Erwin Center. The victory lifted the Longhorns back above the .500 mark, at 17-16, while Jackrabbits saw their record slip to 24-9 in what turned out to be their final game of the season. Osetkowski was outstanding, hitting 9 of 13 shots from the floor, going 4-of-6 from beyond the three-point line; his nine field goals tied for the most he has made since transferring to Texas from Tulane. Freshman guard Courtney Ramey shot 4-of-8 on three-pointers en route to 13 points, while senior guard Kerwin Roach added 12. The game appeared to be over almost before it started, as the Longhorns hit their first five three-point shots to jump out to a 19-0 lead in the first 4:11. SDSU, which got a team-high 25 points from forward Mike Daum and 19 from guard David Jenkins , responded with a 13-0 run of its own. UT’s 11-of-23 shooting from beyond the three-point line allowed the Longhorns to head to the locker room with a 43-35 halftime lead. For the game, UT went 15-of-38 from long range, making the fourth time this season the Longhorns have hit 15 or more shots from behind the arc. The Jackrabbits came all the way back in the second half, riding an 8-0 run to claim a 67-64 lead with 8:12 remaining, at which point Texas responded with a 6-0 run to reclaim the lead. UT’s appearance in the NIT is its first since the 1985-86 season. Texas is now 7-3 all-time in five NIT appearances. Texas, which was without injured center Jaxson Hayes, advances to face the winner of Wednesday’s matchup between Toledo and Xavier.